In single file, the children troop quietly into the ragi field behind their school. Following close behind them, I catch strains of excited chatter escaping the nervous silence. They are comfortable with these conflicting emotions, having waited eagerly for this day for the last three months, tilling the land, sowing and caring for the crop. But, nothing has quite prepared them for the intensity of feelings this important day would bring. Bengaluru has had an unexpected spell of cold rain that could have wreaked havoc with the ragi crop. Have the plants succumbed to the unseasonal showers, I wonder, my worries echoing theirs. Suddenly, from the head of the line, I hear a whoop! Followed by another. I feel my shoulders slowly relax and my breath flow easier. Today is harvest day; the day the students will reap the first ragi crop from this land. Their ragi crop. A field full of finger millet, rich and luxuriant greets us, its earheads standing brown and tall, like arms extended out in welcome. The students’ joy is unbounded - they bolt through the fields, hug and cheer each other, dancing to a quiet music. In this private celebration of the fruits of months of toil and anxious expectation, I am a bystander. Behind me, the tambourine picks up a steady beat and the melody of a harvest song infuses the air. The children gather up their sickles, join in the chorus and are soon lost in the rhythm of the harvest - bending, chopping and collecting sheaves of grain. The Ragi Project, a year long collaboration between Bengaluru-based Poorna Learning Centre and Azim Premji University, is taking middle school students on a behind-the-scenes tour of their lunch. As part of the project, children will grow, harvest and cook ragi - a staple grain of Karnataka - and take the learning from the field into their classrooms. The concept of farm-based learning is not new. It employs hands-on learning in an outdoor environment to complement students’ understanding of curricular topics and is based on the view that a child will only behave responsibly towards the environment if her knowledge of nature’s elements, its patterns and laws are reasonably well developed. Today, as more children forgo the outdoors for the attractions of an indoor life, it falls upon schools, where students spend most of their days, to design context-relevant lessons that foster an awareness of the environment. Community lunches at school regularly feature a ragi dish. Over a meal of ragi mudde cooked by the high school students, I talk to Pallavi Varma Patil, faculty at Azim Premji University and the originator of The Ragi Project. The initiative, she explains, lies at the intersection of her work in the Gandhian pedagogy of learning by doing useful work on one hand, and the interplay of food and identity on the other. The seeds for the project were sowed a year ago during discussions with her university class about the role of food in shaping the growth of cities, and decoding the complex process by which certain foods gain hegemony over others. With their disappearance from our plates, these foods fray the edges of the memories they once evoked and efface the cultures, histories and landscapes they were born of. The project was also intended to teach valuable lessons on achieving food autonomy through farming and become a platform for students to contemplate the impacts of their actions on the environment. The half-acre plot the students cultivate belongs to Poorna staff member, Radha, and is part of a larger land that has been fallow for two years. Ragi received a unanimous vote in early staff discussions on crop choices owing as much to its role in shaping the cultural identity of Karnataka as to its ecological and nutritional merits. 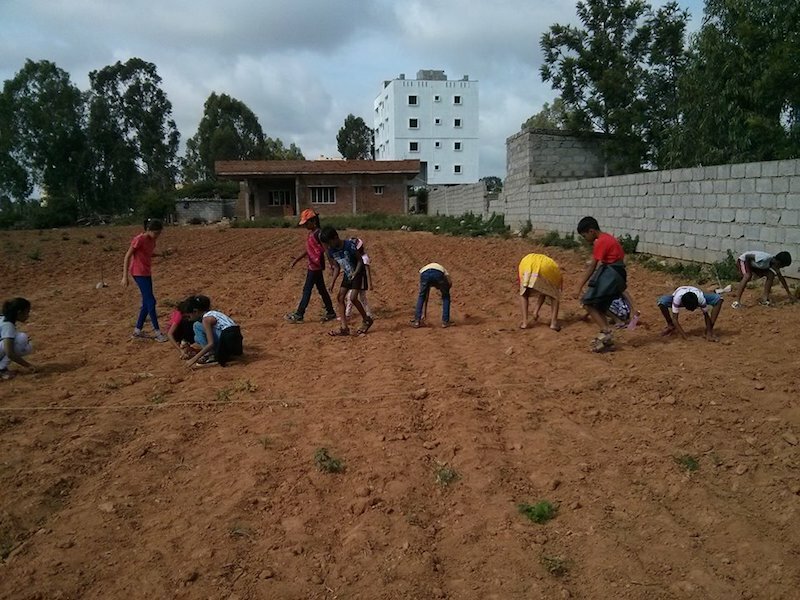 From ecologist, Laksh Kumar of Agastya Foundation, students learned the basics of regenerative farming. They mulched the land with weeds to retain precious moisture and fed it with natural inputs like vermicompost. They practised intercropping with nitrogen-fixing pigeon pea (tuvar) and planted a fringe of marigold to keep pests away. A visit to veteran farmer Narayan Reddy’s bountiful farm, and they returned armed with trivia about the creatures that are friends of the farmer. Today, with the help of Seena Narayanan from ATREE, nearly 20 different insects have been identified on the half-acre plot. But, nothing caused a stir like the discovery of earthworms in the soil did - a sign their soil-enrichment efforts had truly paid off. Much like the Indian farmer, they kept a keen eye on the weather, tracing the patterns of the sun and the rain. And, as they grappled with the challenges of irrigating the land, the choice of the resilient ragi became more obvious to the students. Inchara of Class 4 remembers the day they transplanted the tiny ragi seedlings into the field. It was exhausting and took all day, she says. But, every student and teacher was involved, painstakingly moving the delicate shoots into the soil. As they worked in the field, they tuned their tastebuds in anticipation of the harvest. A student resistance against ragi mudde and malt led to recipe trials that kept the school kitchen busy dishing out the millet in more appealing avatars: cakes, cookies, papad, cutlets and laddoos. Community lunches at school featured a weekly ragi meal and teachers began incorporating ragi into their families’ diets. From the start, The Ragi Project was designed to be integrated with the school curriculum. For teachers like Roshni Ravi who teaches social science, the project brought alive the idea of working with their hands in every discipline, opened their eyes to the web connecting different subjects, and allowed them to link their learning with the larger reality around them. For every activity done on the farm, there was a corresponding lesson in the classroom, says Vasantha, the science teacher, many of whose lessons were prompted by what the children observed in the field. 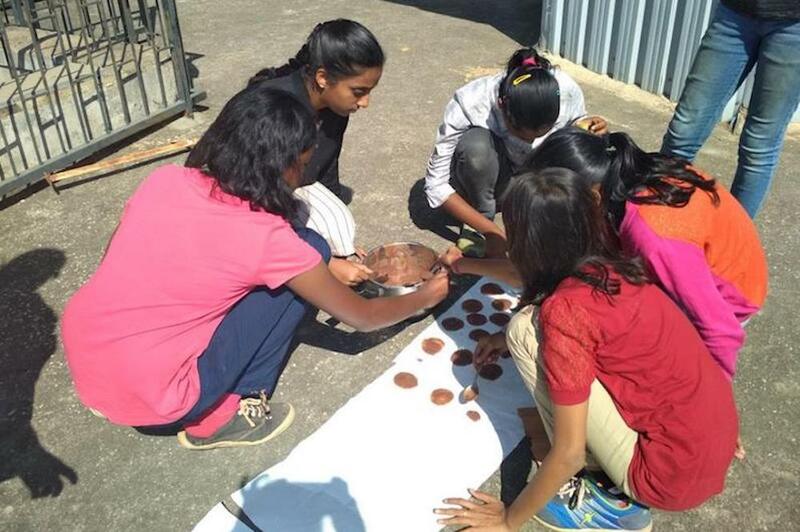 Students quadrupled ragi recipes to master fractions, mapped the terrain of their farm in Geography class, and understood the loss of agrarian land and livelihoods to examine India's food policy. Their Kannada vocabulary was honed to the tune of harvest songs and their creativity exercised by making scarecrows in art class. By tracking the creatures that visit their farm, they’ve learnt important lessons about insect anatomy and wildlife conservation. They’ve discussed falling water tables and food miles, and evaluated the merits of natural farming. Over hours spent observing the land and collecting seeds, they’ve understood biodiversity loss and debated gender - all topics essential for understanding the environment. The fledgling farmers have harvested a few tens of kilos of grain today as they danced to the beat of the ceremonial drum and sang songs celebrating the land. Around them, once productive lands lie barren or make way for development projects. A few in the group are the first farmers in their family while others maybe the last. For some ragi is comfort food. Others eat it grudgingly. But, it's long past lunch hour today and they’re all equally hungry as they listen to folktales from farmer Shamanna. The project was not without challenges of many kinds: water was either in short supply or untimely rains wrought havoc. Teachers shifted timetables around and students bemoaned the loss of play time. The Ragi Project has sparked discussions about much of what ails the environment and Indian agriculture today, and now, Patil hopes that other schools around the country begin spreading the message of safe food through farming. Whether it’s the hardy ker of Rajasthan or the wild xaak of Assam, you can pick an ecologically significant local food and teach your entire curriculum through it, she says. A farm-based education builds in children a knowledge of the environment and their impact on it in the hope that they will become champions of ecologically sustainable development in the future. The Ragi Project has exposed children to a new way of learning and eating, and inspired Radha to turn her field green again. Will it have any transformational, long-term impact on the way these students see the world? It’s too soon to tell. For now, as they get ready to process their harvest and plan what to grow next, they're all set to publish their first cookbook of ragi recipes tried out in the school kitchen. So, keep an eye out for it!